Pure Islamic art is something you do not see frequently in video games. As a matter of fact, some of the video games that have been and are still produced do have references to the Middle East and, in a general sense, to the Islamic world, but the representation of the Orient in video games still relies on an Orientalist narrative, a point of view that counterposes two static entities: the civilised Western world; and the exotic Orient, more or less defined, full of mysteries and danger, enchanting and obscure. This narrative has been frequently criticized and in some aspects recognized as obsolete. Games such as Prince of Persia, Close Combat, Call of Duty and Halo give the player a stereotyped image of the Orient, depicted as “different from us” in all aspects, without any deeper research and contextualisation. In the world of mainstream video games, Islamic art as such has never had a great role; here and there we can find some hints, but they are superficial references used to contextualise the setting. That is why it is so impressive that an indie game designer from Iran is developing and will shortly release a totally different game, with a totally different perspective on Islamic culture and the art that it produced. Engare, designed and developed by Mahdi Bahrami, is one of a kind. First of all there are no characters engaging in a quest, no plot is developed around one hero. This is due to Mahdi’s personal taste, as he explains clearly: “I don’t like games with a plot, they are like movies. I prefer games where I have a clear goal, just like Tetris: games following mathematical and geometrical rules”. 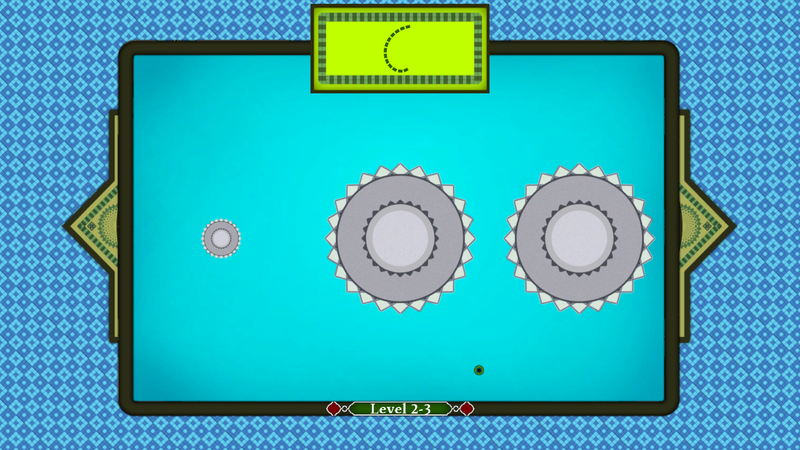 And actually if you have to compare Engare to another game, it is more similar to Tetris than to Call of Duty. In Engare the player is confronted with moving, usually rotating, objects; pointing one part of the moving object one can see the line that it creates. The aim is to create a given shape. You draw it, you win. 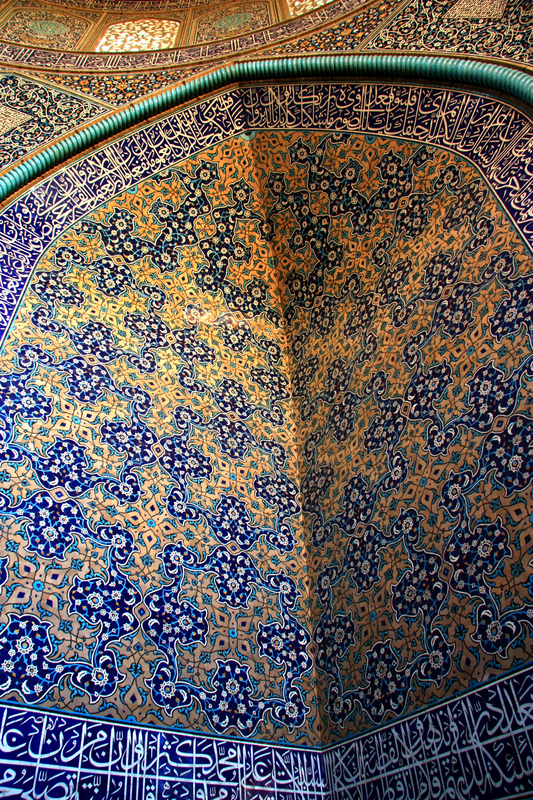 His video game stands out also because of the focus on Islamic art and its pattern. Again, the personal taste and biography of Mahdi play a crucial role in his decision to use maths, geometry, and pattern . Born and raised in Isfahan, his cultural background is imbued with Islamic art. Coming from Iran, Mahdi has a great and long historical past in which to find inspiration for his game. His Iranian friends at Dead Mage Inc., for instance, developed Garshasp, a third-person action-game set in pre-Islamic Persia, with numerous references to Zoroastrianism and Iranian mythology. 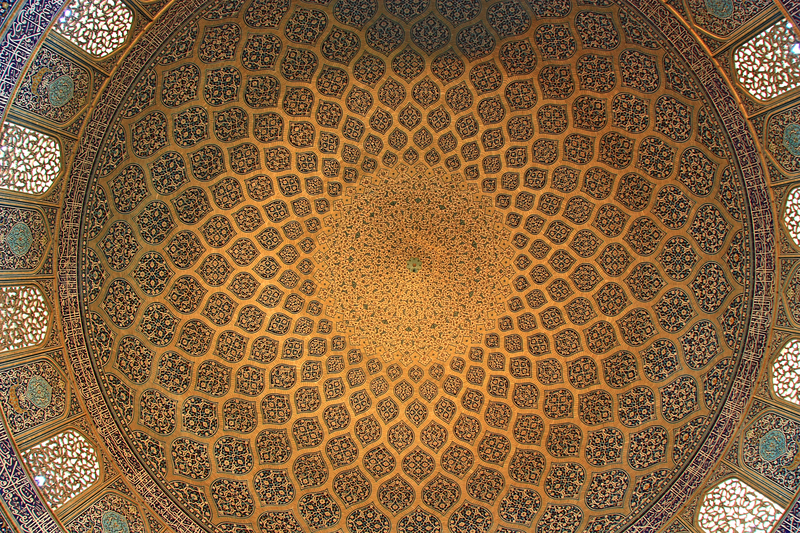 His choice of Islamic art was determined mainly by Mahdi’s love for maths and geometry; the repetition of patterns in Islamic art, ruled by mathematics and geometry but nevertheless enchanting and pointing to the infinite is something that has always fascinated him. The cultural and political moment we are living in pushed him even more to go on with this subject: “People are scared, everything that is Islamic seems to be evil nowadays. I wanted to show that Islam in itself has nothing wrong and can produce something beautiful. I wanted to underline the Islamic aspect of the game. I have decided to release it worldwide and at the beginning, instead of showing a logo, I have decided to write ‘In the name of God, the Merciful, the Compassionate’. In Iran it is common: everything starts with an invocation to God, and I think if I would have released the game only in Iran I would have omitted it. But since I’m releasing the game outside Iran, I want to keep the initial dedication to God.” And he adds cheerfully: “When people will open the game, they will probably feel uneasy reading ‘In the Name of God, the Merciful, the Compassionate’, but when they’ll start to play, they’ll realise nothing is actually wrong with Islam”. But again, the main reason that pushed Mahdi to pursue the design of Engare is geometry. When he launched Everything can draw!, his attention was focused on geometry. The connection with Islamic art came later. When reading an article published about his game, he started to realise the connection and eventually he decided to develop it. And citing the work of Peter Lu, researcher at Harvard studying physics and also Islamic geometrical patterns, Mahdi explains that “we are not one hundred percent sure of how the patterns in Islamic art were created, using which tools and following which rules”. 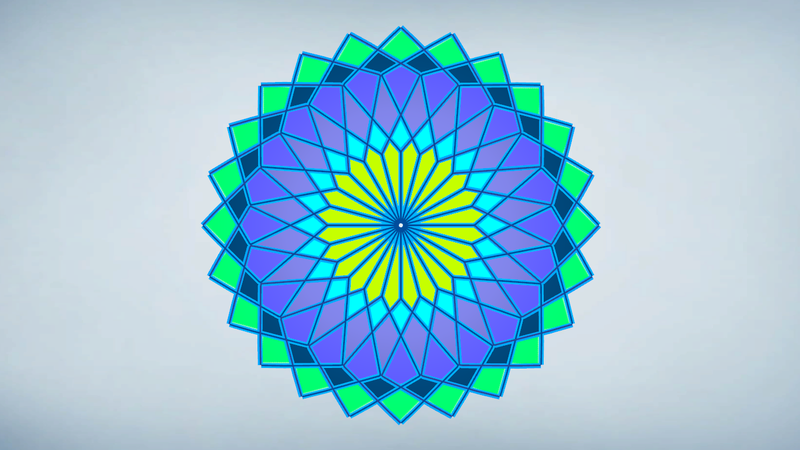 And the intriguing question is: can a video game shed light on the design of patterns in Islamic art? Engare is an appealing and enchanting game. Just like Islamic art, it can be enjoyed on many different levels. A kid can enjoy the rotating and mesmerizing elements that create shapes, a graphic designer enjoys the ease with which patterns can be created, and even those who are less familiar with the Islamic world will love the atmosphere created by the visual concept and the evocative music, composed by the Iranian musician Moslem Rasouli. 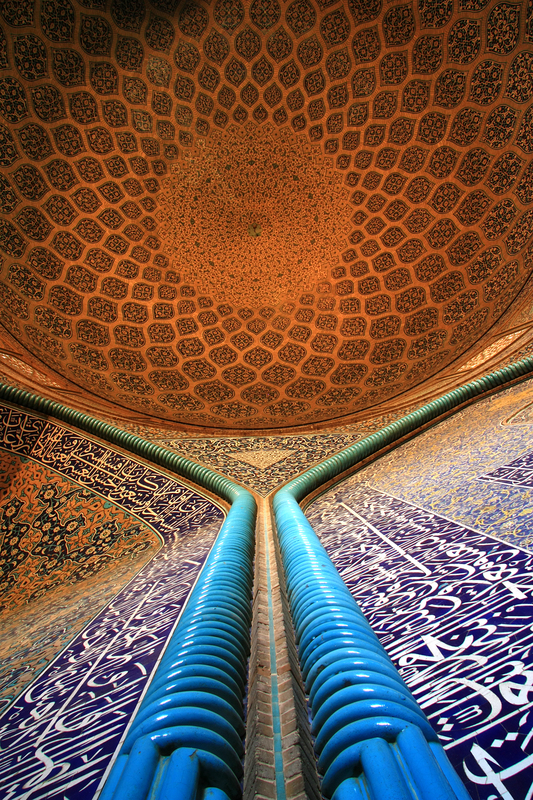 Last, an expert in Islamic art can possibly draw new and challenging conclusions on the creation of patterns.